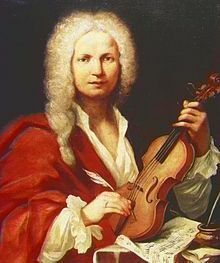 Probable portrait of Vivaldi, c. 1723. ↑ "An anonymous portrait in oils in the Museo Internazionale e Biblioteca della Musica di Bologna is generally believed to be of Vivaldi and may be linked to the Morellon La Cave engraving, which appears to be a modified mirror reflection of it." Michael Talbot, The Vivaldi Compendium (2011), p. 148.